On March 19, Chinese Consul General Zhao Weiping met with Governor of Wisconsin Scott Walker and attended the pre-mission briefing of Wisconsin trade delegation to China in Madison, the capital city of Wisconsin. Consul General Zhao briefed Governor Walker and the delegation about the recently-concluded Chinese National People's Conference and the Chinese People's Political Consultative Conference as well as China's foreign and economic policies, and expressed his views on current China-U.S. relations and how to expand the friendly exchanges and substantive cooperation between China and Wisconsin. Consul General Zhao welcomed Governor Walker to lead the Wisconsin trade delegation to visit China in April and highly appreciated that Governor Walker and the Government of Wisconsin attached great importance to promoting cooperation with China. 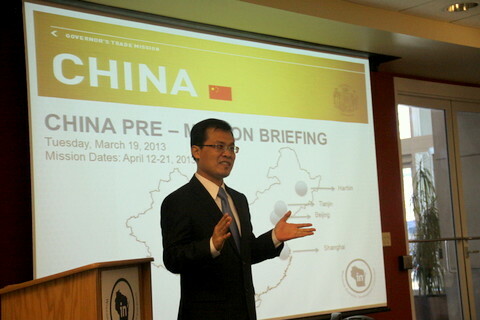 He said that China would work with Wisconsin to achieve new progress in the bilateral cooperation between the two sides. Governor Walker said that China had already become a key partner of Wisconsin. He looked forward to the upcoming China trip in April and hoped to strengthen the exchanges and cooperation in extensive fields between the two sides. He also welcomed the Chinese enterprises to make investment in Wisconsin and expected more Chinese students to come to study in Wisconsin.